Casino Pawn and Gold has THE most aggressive cash paid, giving our customers more cash for their short term Electronics Loans! GUARANTEED! Located in Casa Grande, we also serve, Coolidge, Maricopa, Eloy, Arizona City, and the Florence Area.Electronics Loans are a fast and convenient way for you to get the cash you need right away. We pay the most cash for your plasma TVs, digital cameras and recorders, stereo systems, speakers, flatscreens, blu-rays, iPhone, Blackberry, Android, iPods, or other electronic items with our electronics loans. We also loan on Denon, Onkyo, Teac, Pioneer, JVC, Sony, Macintosh, Samsung and others with our electronics loans in Casa Grande. We loan on desktops, laptops, and monitors and on anything computer related. With our specialist on-site we guarantee that we will loan the most on our 90-day, short term pawn or electronics loans on Apple, Dell, IBM, Compaq, Toshiba, Sony, Epson, HP or any other brand. Please bring all remotes, manuals, power cords and accessories. 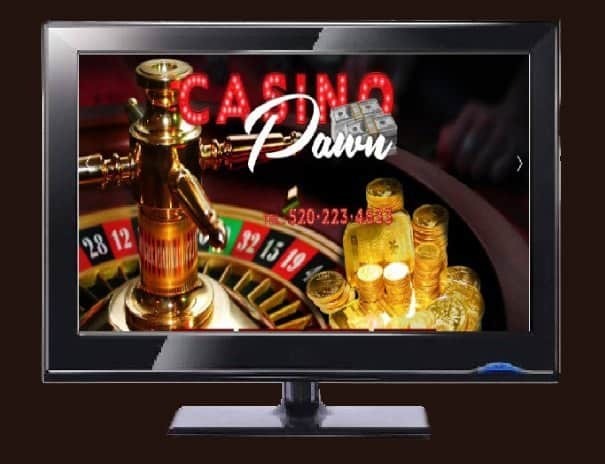 It all starts with you coming on down to Casino Pawn and Gold with your electronics. No matter if it's a cell phone, computer, stereo systems, or televisions, the best way for us to get you an accurate appraisal for your items. It's also important that when you bring these items down, that you also dig out whatever extra accessories that came with the item with you. Once you're inside our store, one of our lovely associates will take the item for you. Before we look to see what the global selling price is, we'll investigate the overall condition of the item first. We begin by looking at cosmetics, whether there are scratches or dings on the outside of the item. More importantly though, after this, we'll be investigating the working condition of the item. For example, with phones, t's ability to make calls, play videos, whether the speakers are working, things of that sort. Lastly, we'll check out what the phones are currently selling for used in the electronic marketplace. Lastly we make you a cash offer. We don't deal with checks, money orders, nothing like that -- you have to wait all of five minutes to get your cash. Should you accept, we'll put cash in your hands and collect a few signatures from ya. Throughout the duration of your loan, your item gets stored in our secured, insured storage facility. It'll be there waiting for you whenever you're ready to come get it. What we always suggest to our customers is that they bring down multiple electronics items. This way we can almost guarantee hat we're able to get you the price that you were looking for. This doesn't necessarily mean you need to take a loan on everything, but it allows us to pick and choose items until to get you the cash you need. We Make Cash Loans on Everything! In addition, we also loan on musical instruments. We give you cash for acoustic, electric, and bass guitars, drums, saxophones, synthesizers, and amplifiers. We will give you the most money for your Fender, Washburn, Guild, Les Paul, and Gibson guitars and store them in our safe and secure storage vault for the duration of the electronics loan in Casa Grande. If you have any electronics that you would like to get a loan on, stop by the pawn shop located in Casa Grande, Arizona for a free quote or give us a call: (520) 233-4633. Don't forget we also serve, Coolidge, Maricopa, Eloy, Arizona City, and the Florence Area.